Out of the new cookbook, Simple Recipes for Joy , by Sharon Gannon, I found a recipe that looked like a little more work, which is right up my alley. I like a challenge! It turns out that this recipe was really easy to make and it turned out great. 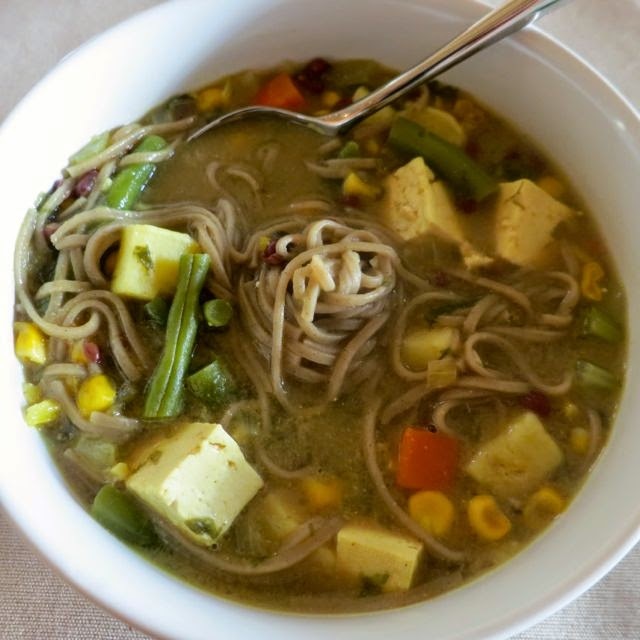 The Curry-Tahini-Shoyu Noodle Soup is a one-pot meal filled with fresh vegetables, aduzuki beans, tofu, and udon noodles. It's a mildly spicy Japanese country stew that is perfect for a chilly evening. Make it now, then share it with your friends. Prepare the noodles according to the directions on the package, drain, and set aside. 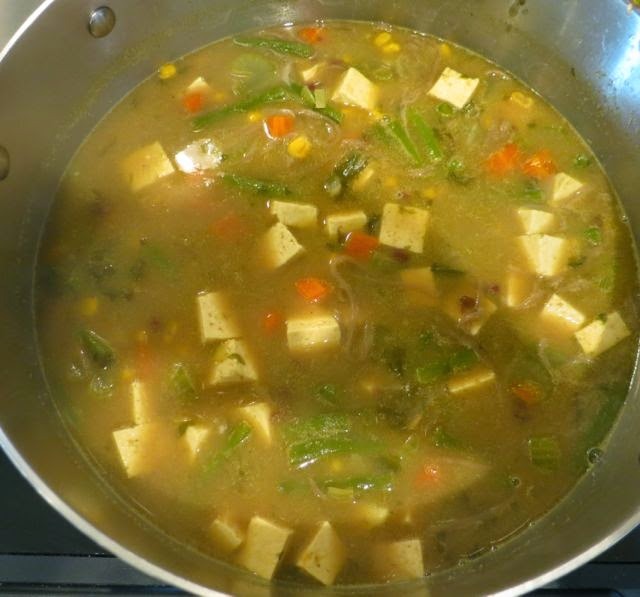 In a large soup pot, place the sweet potato, green beans, carrot, celery, corn, beans, stock, seaweed, and water and bring to a boil over high heat. Reduce the heat to medium-low and cook, covered, for about 20 minutes, until the vegetables are soft. 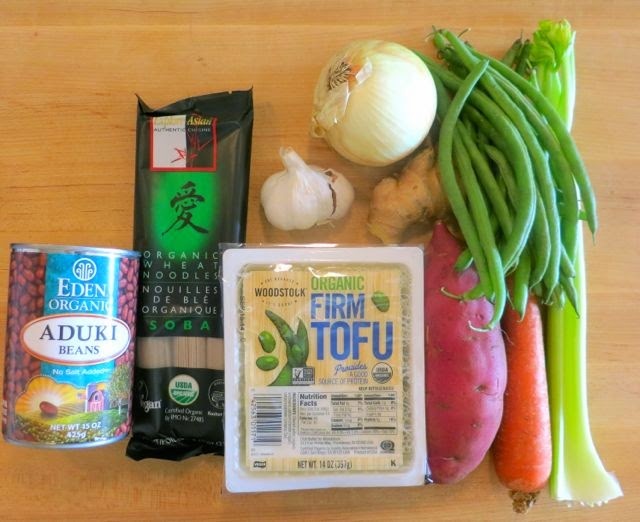 Meanwhile, in a small bowl, mix the tahini and miso to make a paste, then set aside. In a small frying pan, heat the oil over medium heat. Add the ginger, garlic, and onion and saute for 5 to 10 minutes, until the onions are translucent. Add the curry powder, coriander, and cumin and cook for about 3 minutes, adding just enough water to keep the mixture from burning, until well mixed and the spices are fragrant. Add the noodles, sauteed mixture, tahini/miso mix, tofu, salt, and pepper to the pot. Stir gently to incorporate all of the ingredients. 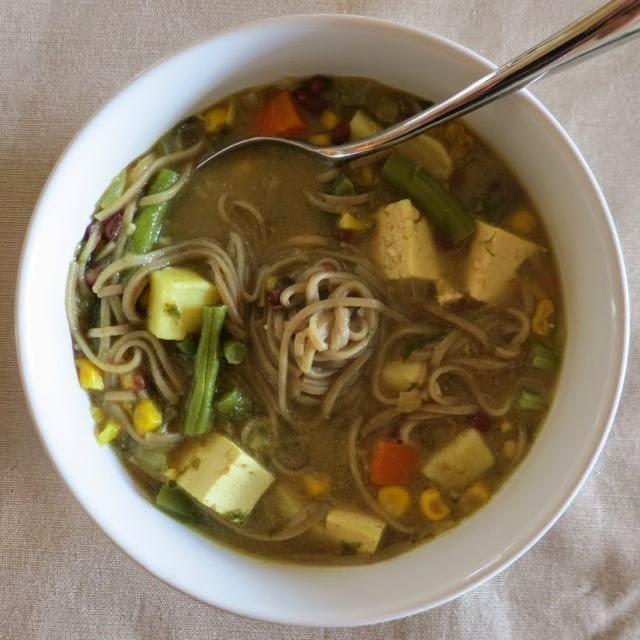 Ladle the soup into individual bowls and add several drops of sesame oil in each bowl.